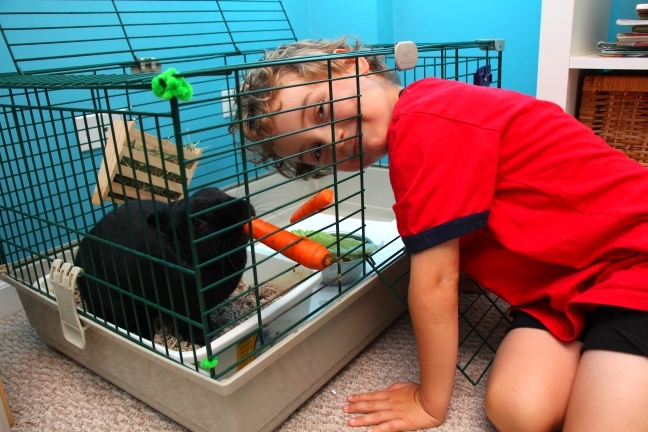 Ollie’s classroom has a rabbit named Gus, and for two weeks over the summer, Gus came to live with us. I had a rabbit as a pet when I was a kid. He was named Thumper, as all rabbits were in those days, and I remember him vaguely fondly. However, Thumper was an outside rabbit, and thus of limited ability to interact with. Gus, on the other hand, is an inside rabbit. 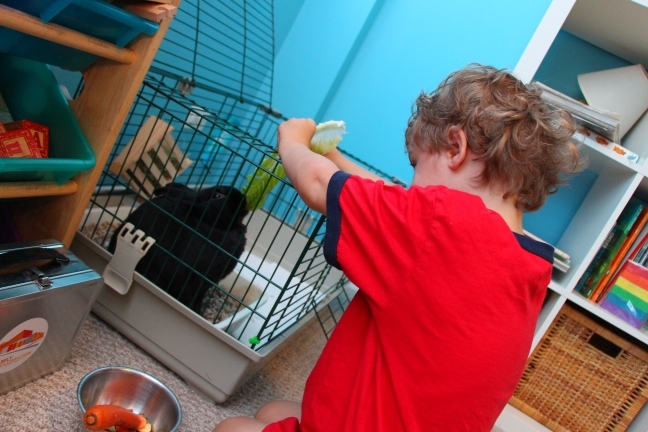 Did you know rabbits can be potty trained? It turns out that Gus is litter trained, making him a pretty easy going pet. He goes in his cage at night, and in the morning you just open it up and let him hop around. He kind of does whatever he wants, which is mostly hop up and down the hallway and hide behind the couch. When he’s hungry or has to go to the bathroom, he goes and does his thing. No need to walk him or groom him or feed him dead mice, or whatever else you do with your pets. We were a little worried at first about him chewing on cords, since we had heard from some of the other parents that he liked to do that. However, after a few days we kind of just let him have free run of the house, and he didn’t cause any trouble. Maybe it’s because Gus is very old, or maybe it’s because Gus is used to dealing with a classroom full of 3 year olds, or maybe it’s just because rabbits are awesome, but Gus never caused any trouble at all. Rabbits are kind of the perfect pet. They’re friendly, they play games (mostly just having you stand things up so he can knock them down repeatedly), you can pet them, they don’t make much of a mess, they kind of take care of themselves, they DON’T MEOW OUTSIDE YOUR DOOR AT 5 A.M., and they basically just eat your compost. We did buy him some things (it turns out rabbits really do love carrots), but we also just grabbed a little of whatever we found in the garden: parsley, basil, raspberry leaves, small tomatoes, and kale. Gus loves kale. We weren’t exactly sure how Nala would handle Gus. From what we read online, rabbits usually terrorize cats, not the other way around. True to form, Gus basically couldn’t care less about Nala. He just ignored her and did what he did. Nala on the other hand was NOT very happy about Gus being here. She basically kept him under constant surveillance. At first she would hiss and slap him whenever he came by, but eventually she (more or less) got over that. Still, she never quite got used to him. At night she usually goes into Ollie’s room to wait for us to come in and read the story, but with Gus in there she wouldn’t set foot in the room, even if Gus was in his cage. Maybe it’s because she realized that a friendly rabbit is a vastly superior pet, leaving her days numbered. 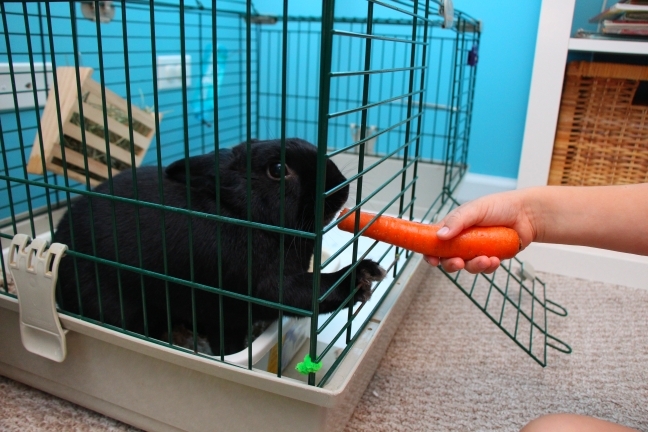 Pingback: “Why I Should get a Bunny” – a persuasive essay by Evelyn | Is this thing on? Pingback: The bunny has landed | Is this thing on?